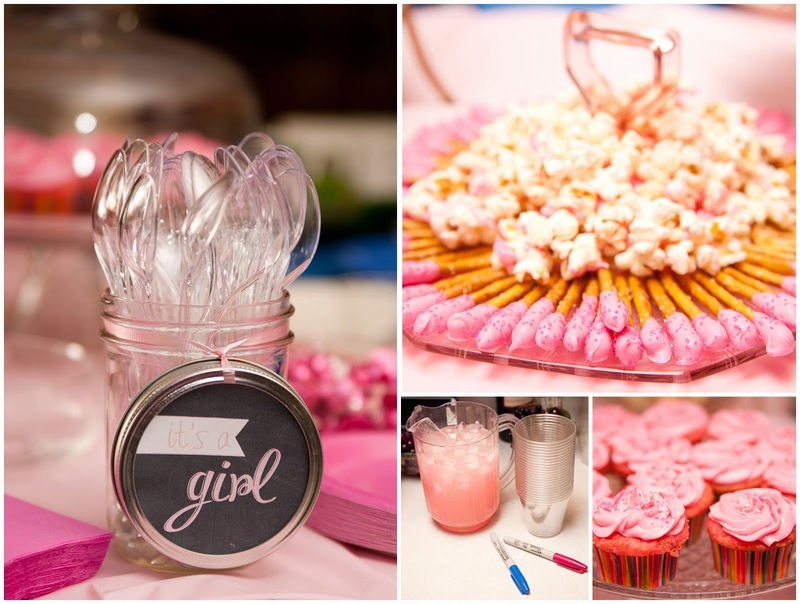 Nothings and Notions from my Noodle: Gender Reveal Party: He or She? 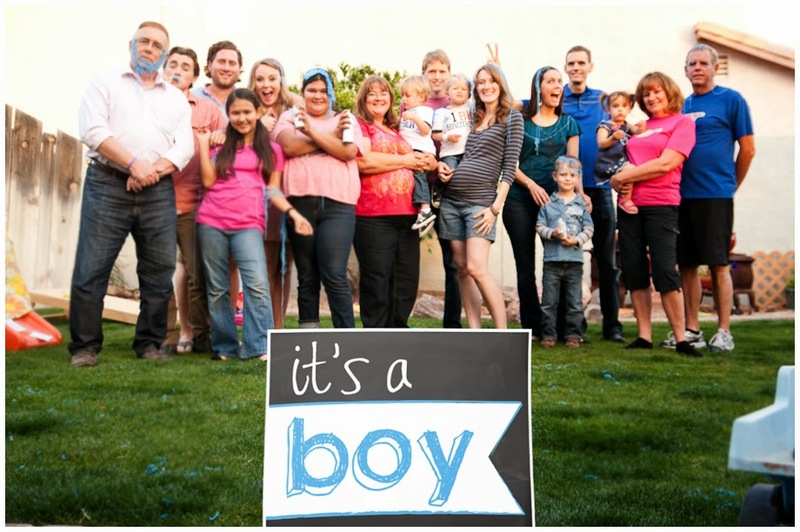 Gender Reveal Party: He or She? "I'm so glad you're having another baby - you throw such fun parties!" I won't disclose which family member said this (with a wink and a smile of course), but truth be told - I share the same sentiment. 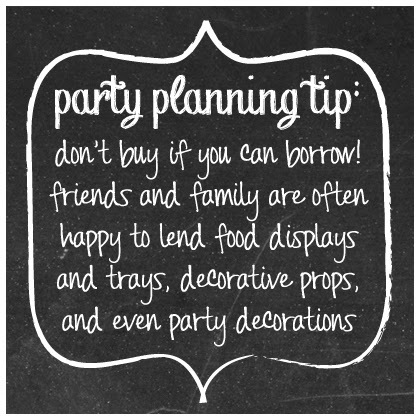 I love themed parties and the creativity that goes into planning them (Pinterest only makes my "love" borderline obsessive... fortunately, I have strict and realistic budgets to stick to when party planning). Okay, so. The party. YAY! I designed invites, banners, signage, photo props and all kinds of adorable stuff that I could go on and on about, but instead, I'll just show you the final results. First Off: Games and Activities. 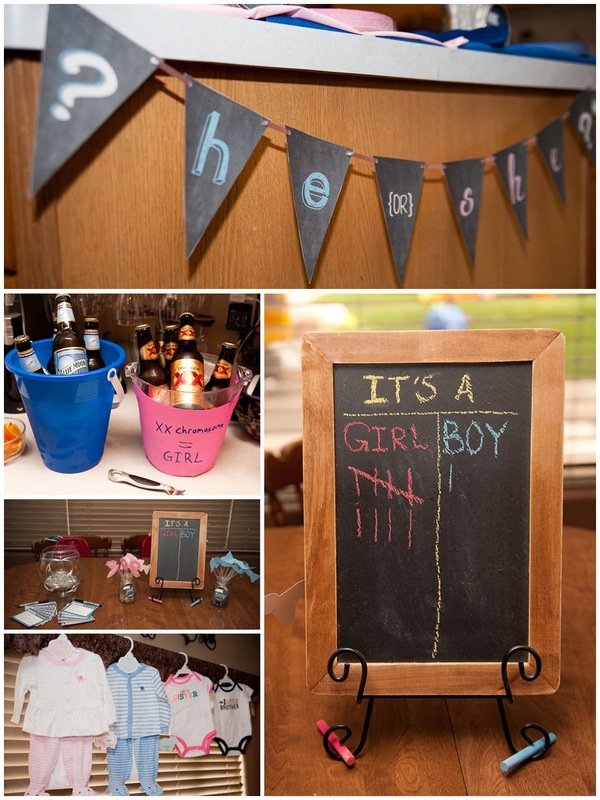 Guests dressed in pink or blue to make their predictions on the gender. We also had a tally board for guests to place their votes. As you can see below, the votes were pretty lopsided. When you already have two boys, people tend to assume that surely your body will magically produce a female child in order to maintain a balanced world populous. 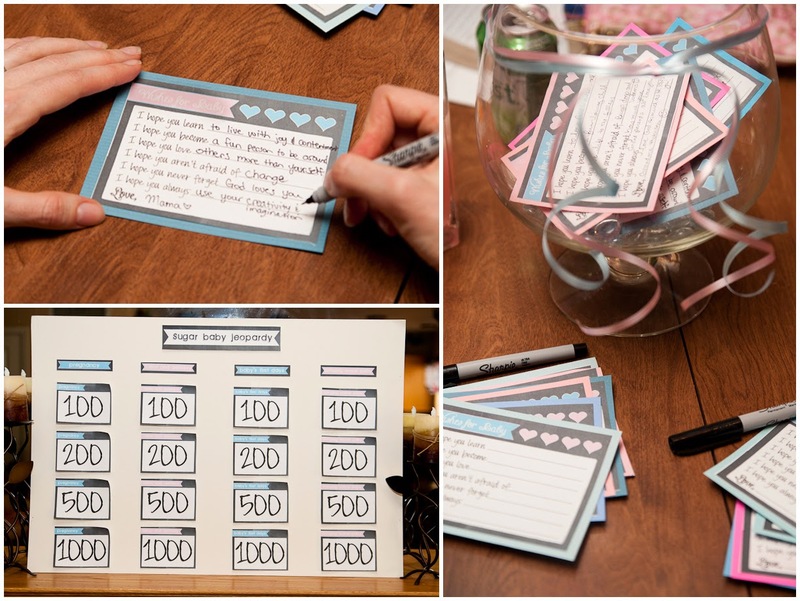 We also had fill-in-the-blank notecards that allowed guests to write some "Wishes for Baby." Some of the answers were really amusing. Example: My ten-year-old sister, Julia, completed the forth question thus: "I hope you aren't afraid of: me." For a party game, we played a rather competitive round of "Sugar Baby Jeopardy". The answer to every question was the name of a candy and the top teams got to compete in a Final Jeopardy round to determine who would have the honor of revealing the baby's gender. It was intense. We have some serious game-players in our family, let me tell you. The questions were hilarious (I wish I could take credit for writing them). Such treasures as, "Q: The Conception. A: What is a 'Skor' bar?" And, "Q: Difficulty lactating. A: What are 'Milk Duds?'" In addition to wearing our "team" colors, I made pink and blue photo props for team pictures. 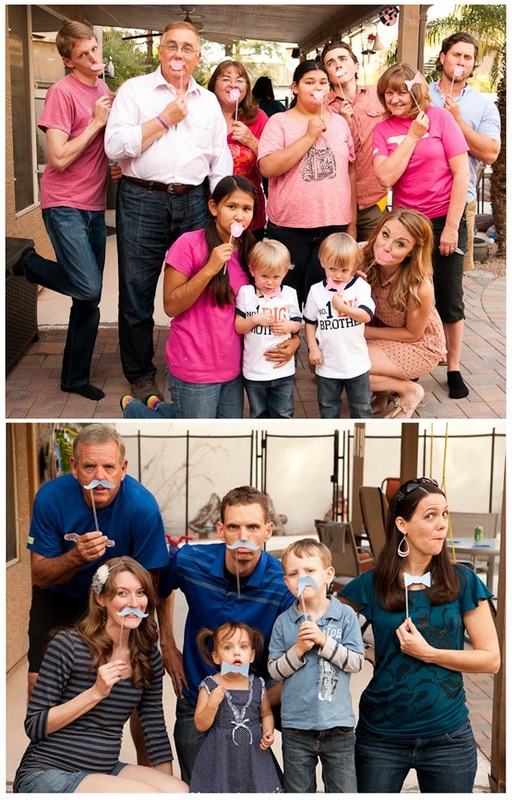 Mustaches, lips, bows, and bow ties - I don't care if it is a trend, I love the photo prop movement! 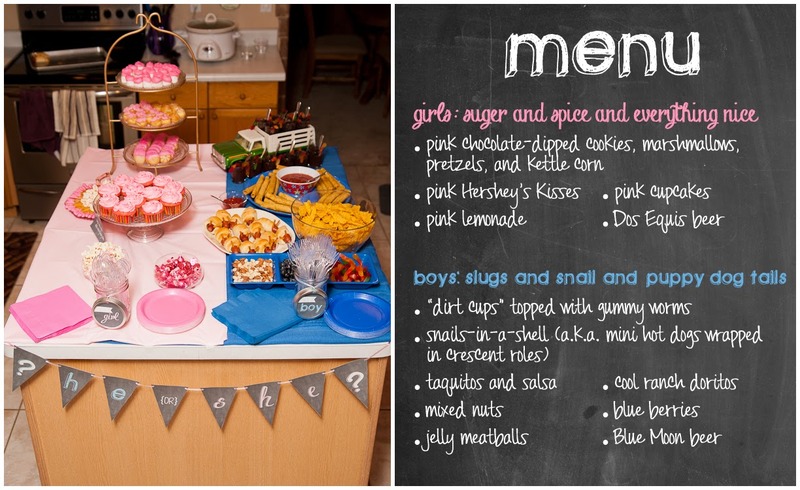 My inspiration for the party food was that old poem about What Little Boys/Girls are made of. Never mind that it's slightly sexist, if not misandristic, it made for a really cute food spread. The themed food was perfectly complimented by all the awesome trays and serving items that I borrowed from my mother-in-law. 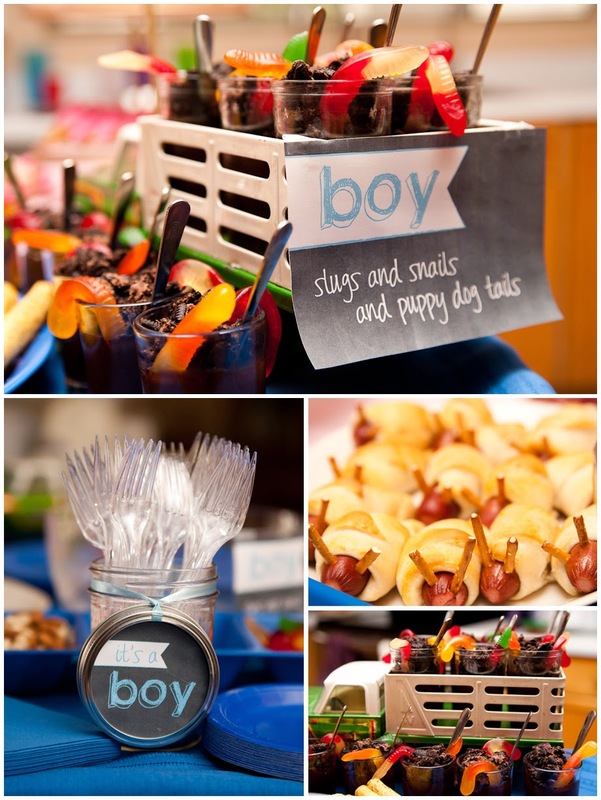 My favorite piece was a vintage toy truck that held mini dirt cup shooters - perfect for the boy food. And Finally: The Big Reveal. We wanted this reveal to be just as fun and playful as when we announced the twin's gender (by popping balloons filled with colored confetti.) Our solution: SILLY STRING! As mentioned, we had the top two teams from our Jeopardy game compete for the honor of the reveal. We did a race of sorts, where the teams tried to answer four baby trivia questions as fast as they could. Then when the final question was answered by one of the teams, they could race across the lawn and grab a can of silly string. There were only six cans and about twelve adults, so as soon as the first can was snatched, anyone could run and grab the remaining cans (if you've ever played the card game, Spoons, it was a similar idea). It was fast and fun and really heighten the anticipation for the reveal. 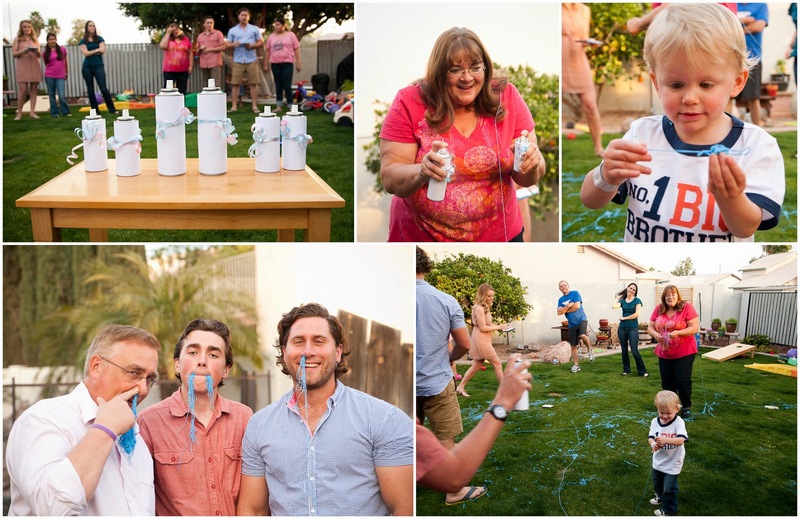 And the result was.... BLUE silly string! 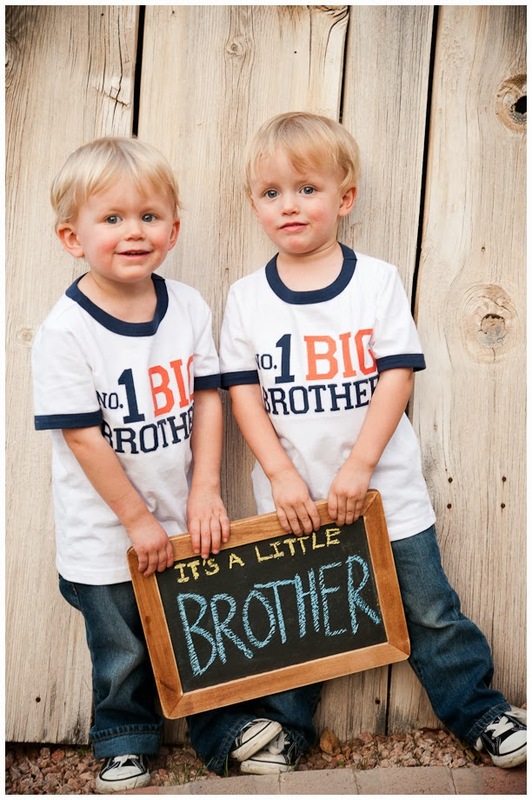 Even though the twins had been adamant that they were having a baby sister (they can't seem to comprehend that anyone besides their twin could be their "bro"), I think they were pleased with the result. I'm still reeling from the creative outlet you plugged this party into. WOW!! Haha! Well I definitely needed to UNPLUG after the party was over. 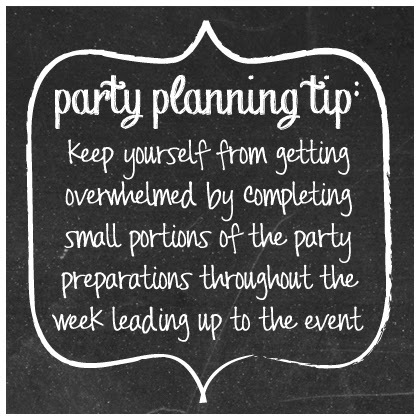 I had so much fun planning, preparing, and partying, that when everything was over and I stopped for a second, I completely crashed. Don't worry, that's not a, "Why wasn't I invited" comment! (Although I realize it could sound like that). 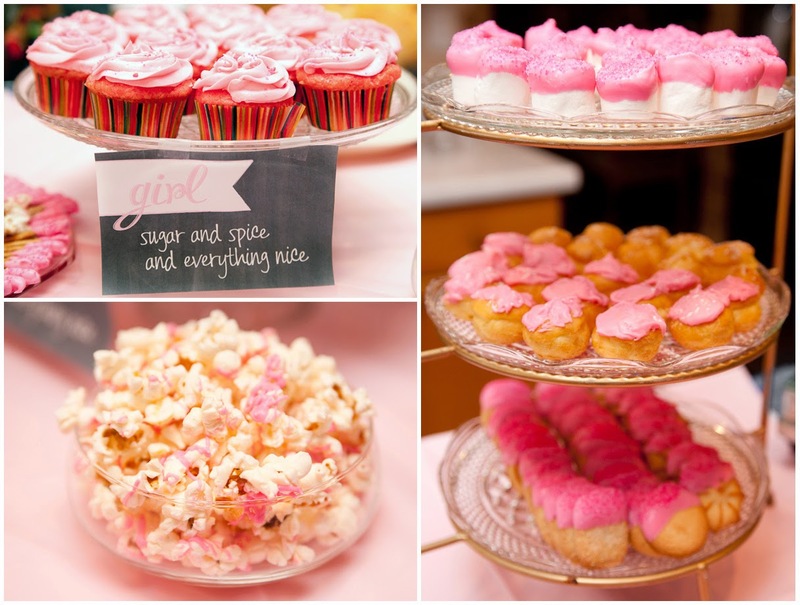 I'm hosting a gender reveal party for my sister in law and absolutely love the sugar baby jeopardy! Where did you get your questions? Hi Missy! I found most of the questions online (searching something like "baby trivia candy bar names") and then designed the board and questions. I rewrote the trivia in Jeopardy format. 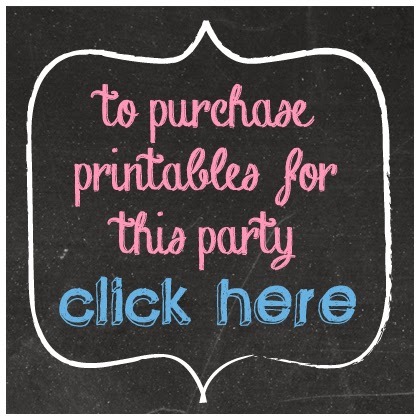 If you're interested in purchasing printables for the party (including the game), shoot an email to devin@offbeatgraphics.com and he can give you all the details! Got some Notions of your own about this post? Share them! All content - including photographs - is property of Jennifer Hanson and may not be copied. Watermark theme. Theme images by Jason Morrow. Powered by Blogger.